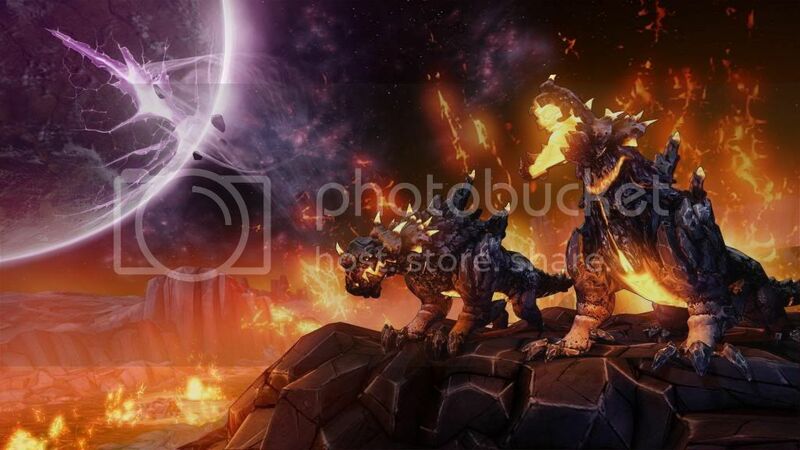 PAX East 2014 Preview: Borderlands: The Pre-Sequel! One of the surprises leading up to PAX East was hearing about the new game in the Borderlands franchise called Borderlands: The Pre-Sequel! Developed by 2K Australia with heavy partnership from Gearbox, this new title focuses on Handsome Jack’s rise to infamy in the period between Borderlands one and two. While the game was not playable by attendees at the show, Gearbox and 2K Australia had a developer-led playthrough of the new game that was focused on introducing new characters, environments and weapon types. It was a great presentation and alleviated my fears that this would be just more of the same Borderlands we are used to. The presentation started with the character of Athena, a Gladiator class who was an NPC originally introduced in DLC for the first Borderlands. Athena’s abilities focus on a shield she can generate to absorb shots and then fire for tremendous damage. As the presenter moved around the world, which is the moon orbiting Pandora, he introduced some of the new mechanics offered by this new playground. On the moon the gravity is lower, which allows for higher and longer jumps, as well as the potential to knock items and even people off the surface with enough force. The second major addition was an extra item slot called O2 Kits (but which looks like it says “OZ Kits,” a nod to the Australian development of the game); these slots not only give an oxygen timer but also have benefits similar to ones given on shield slots. As they started to move around and explore, the addition of O2 kits and Oxygen itself started to really come out as a huge difference in this title. Certain areas have breathable environments being generated and others don’t; smash a canister when there is no oxygen/gravity and items float away. Kill a bad guy just right and he floats away into space as well. You can also fire at people’s helmets to cut off their oxygen supply, which could be a key tactic in some battles. The oxygen tank you carry can also be used tactically to trigger longer or higher jumps, but it depletes oxygen faster which is something you have to be aware of. The O2 meter can easily be looked at as similar to the shield bar – you are in trouble one way or another when it starts to get low. Thankfully there are air pockets all over the place (and marked on the map) as well as atmosphere generators and buildings that can replenish your O2. Plus the O2 kit is another item type, so larger and more powerful ones can be found as you play. The developer then took us to a loot drop in order to explain some of the new weapon types found in The Pre-Sequel! The first was a cryo gun model that is a first for the series, giving the ability to slow, then finally freeze enemies with multiple shots. If enemies are killed when frozen they shatter, which actually looked really cool in the low-gravity setting. A neat moment occurred with this gun type later in the playthrough when an enemy froze and was shattered in low gravity with the bits floating away. When atmosphere was restored the bits fell to the ground all around. The other major weapon type is a sustained laser-style weapon that can have whatever elemental power the gun happens to be created with, so you can have a fire, ice or corrosive laser. Of course all the weapon manufacturers have their variants as well, so assume some fire faster, some explode and others do other over-the-top actions you would expect from Borderlands guns. The developer was playing alone as Athena and she was quite effective especially once the shield’s ultimate power was unlocked, giving her the ability to chain-hit many targets. Soon though a large horde appeared and another presenter jumped in and started playing as Wilhelm, who was the first boss from Borderlands 2. 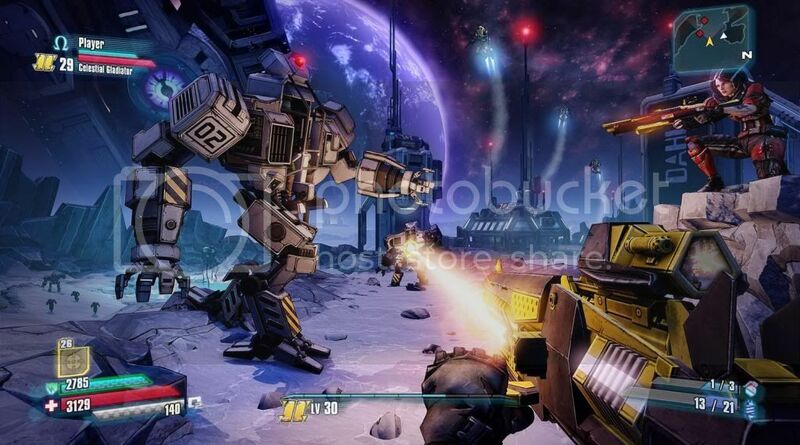 In Borderlands 2 Wilhelm is a giant robot, but in The Pre-Sequel! he is a cyborg and his skill tree is all about adding other robotic components until he is the Wilhelm we know. His key power is called Air Power and it revolves around calling in Drones to assist you. Wilhelm is a Defender class and he looked pretty interesting and will be the tank class in this title. Wilhelm and Athena took on waves of bad guys, working together to take advantage of frozen enemies and claiming oxygen-rich areas. Eventually they encountered a mini-boss called Red Belly who kicked Athena through the glass of the compound, and the demo ended with her flipping through space. 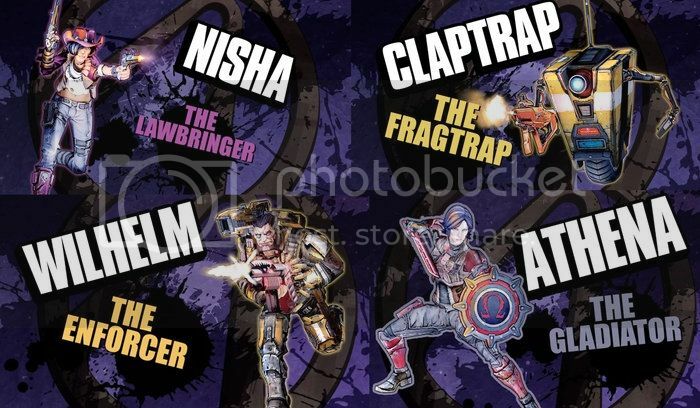 There will be two other playable characters available upon initial release, ClapTrap the FragTrap and Nisha the Lawbringer (who was sheriff of Lynchwood in Borderlands 2), but they were not presented as part of the demo. Initially I did not have a lot of excitement for Borderlands: The Pre-Sequel! I assumed it was just Borderlands with a coat of paint, but the story of Handsome Jack becoming the head of Hyperion seems interesting and the new tweaks look fun. The inclusion of O2 kits and the new gun variants look to add depth to the game and we were even teased with a new moon vehicle that looks like it will be a blast to drive around Pandora’s moon. Interestingly enough the game is coming to last-gen consoles (PS3, Xbox 360 and PC) so that the developer could focus on content and not engine changes to suit the newer-generation boxes. 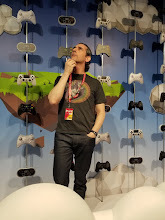 This also means we get to play the game that much sooner, and after what I saw at PAX East I am looking forward to finding a gazillion new guns in Borderlands: The Pre-Sequel! when it is released this fall.